Daylight will see Esther riding Titan from Ceduna Racecourse through the main street alongside the magnificent waters of the Great Australian Bight! On our way across the Nullabor. we’ll be camping at Penong tomorrow night, the horses will be yarded at ‘Heaven’ just on the Western side of Penong and we’ll be having dinner at the Penong Pub and meeting up with some locals. Ceduna is an amazing little town (approximately 3 000 people in area) with brilliant facilities. Exceptionally clean and bright CBD area. 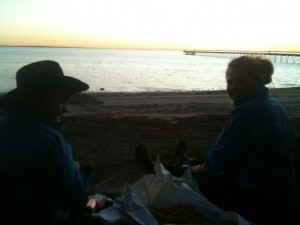 Ceduna Beachfront, sunset dinner for ride4acure crew. Yesterday Esther, Joe and I visited both schools in town Ceduna Area school which caters from Kindy to Year 12, and also the Crossways Lutheran Central School which caters from Kindy to Year 10. Great groups of students who were very engaged with ‘Mela-What?’ One of the questions I put to the student groups at every venue I go to is ‘Hands up if you’ve learnt something new today?’ and always most hands are held up- I then invite the young people to share what they’ve learnt with one other person to help us ‘put melanoma on the map’. 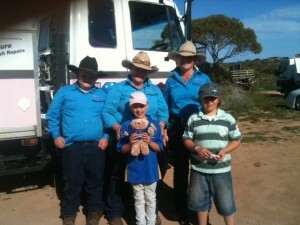 Also on Sunday had lunch here with the Far West Pony Club who put on a delicious BBQ lunch for us. In SA pony clubs are made up of both kids, young adults and mature aged riders. There is no upper age limit to riders! NSW you can only ride til your 25 . We’re also putting ‘webisodes’ of the trek on www.horsetalktv.com.au and Horsetalk (on pay TV) are also putting together coverage of the trek that will air later in the year. Big news is our NSW chaff and Hosilage sponsor David Wallis from Manuka Chaff Quirindi NSW very generously secured us sponsorship for our WA leg of the trek. Quarintine regulations prevent us taking into WA any lucerne based products. David secured sponsorship for us and also organised the transport of three pallett loads of chaff and hay to the SA/WA border for us to pick up when we cross. We are so grateful for his help with this. David has been incredible all the way from the first instance we approached him for sponsorship back in February I think. 24 hours after my first phone call we had a pallet of his wonderful Manuka chaff and horsilage delivered to Coffs Harbour for Esther when she was there. And he’s been consistantly excellent all the way through. We’re indebted to Manuka for the amazing support we’ve received. Couldn’t have done it without them. A beautiful little gem out of this is the WA hay company WesternHay www.westernhay.com.au is that Richard Rose the proprietor and his wife have a 7 month old baby daughter called Hannah Rose. this is the second 7 month old baby girl we’ve met along the trek who is called Hannah Rose and also both little girls are daughters of lucerne producers!!! We’ve had since Saturday here in Ceduna, four whole days supposedly ‘rest days’. We’ve decided that’s a complete misconception and if we’re ever crazy enough to do another trek in the future be called ‘busy days’ because they’re chocka block full of jobs! One of the worst is washing clothes! 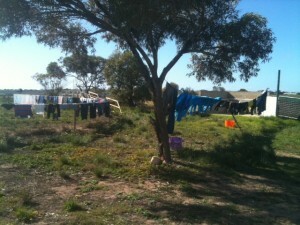 Drying washing at Ceduna racetrack! Having said that we’ve managed a couple of waterfront artery clogging dinners! Joe got a fish in today on the long wharf at Ceduna and managed to catch a shopping trolley! This morning at 7 am we had Shane Doudal come and do a quick farriering job for us with Meg (she’d lost the tungstan plug out of her horseshoe. the plugs are quadrupling the life of the shoes for us which is awesome, but it’s a technical job to get them in securely! Beyond my simple skills. Anyway there isn’t actually a farrier in Ceduna, nearest one is Streaky Bay. Shane works out in a mine on the Nullabor but happened to be home on his days off and volunteered to come shoe Meg before he had to fly back to the mine site! Lucky us! We keep meeting fantastic people who step up to support the trek. 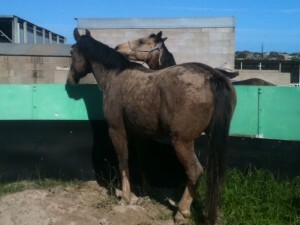 the horses have enjoyed having four straight days rest. They’re fresh and fighting fit again. 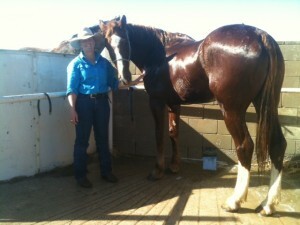 On Sunday each horse got a good wash, and also heaps of gear like saddle blankets, sheep skins, bell boots! We’re grateful to have the water here to do that as we’ll now be on severe rations as we head into bore water country. Most of the roadhouses apparently have their own desalination plants for the bore water. Just hope our horses will drink it! We have some ripper ‘tablets’ that will neutralise the water donated by Olsonns stock feed supplements. Touch wood they’ll mask the flavour enough for the horses to drink it. Titan after his shampoo looking very dapper! We will be less regular with website updates and blogging as we’re going out of range for a few weeks, however will be able to post updates at a couple of the roadhouses! So my apologies in advance. I will endevour to do my best with capturing this epic part of the trek as Esther rides across the iconic Nullabor Plains. Truly we’re going into the ‘big empty’ for a while and the three of us feel okay about that. We’ll keep safe and continue the Journey. This entry was posted on Tuesday, June 28th, 2011 at 11:18 pm	and is filed under General. You can follow any responses to this entry through the RSS 2.0 feed. You can leave a response, or trackback from your own site.